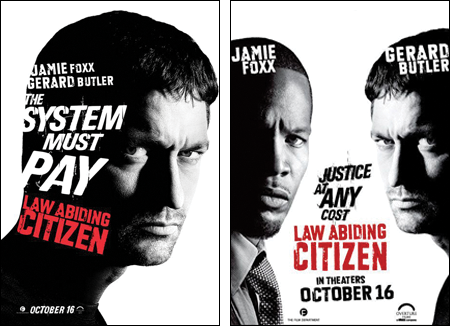 We’ve ‘featured’ a new trailer today for Law Abiding Citizen, a new thriller starring Jamie Foxx and Gerard Butler. It’s all very new. Law Abiding Citizen looks like an absolute smash of a film. Movie poster designers aren’t even trying to hide the fact that they’ve reversed characters’ heads any more. Gerard Butler has a weird neck.